1 large football serving tray in each package. 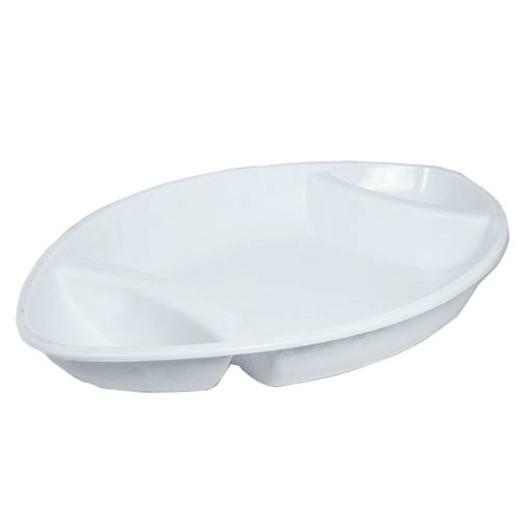 This oval plastic tray measures 18".|Gone are the days of serving out of a suitcase! With these beautiful 18" football shaped plastic serving trays, your servers don't have to hide their trays in their jackets anymore. Be proud of these football serving trays and serve with pride! At this price these large football trays can be reused many times, and at this quality you might want to use these round plastic trays over and over again! These Trays are great for serving salsa on the sides and chips in the middle. Display your food in an organized fashion with our football reusable trays! L: 18.0 in. W: 12.0 in. H: 2.5 in.